Founded by independent retailer Isaac Benson, Guide London is set to reach its 25th anniversary in business later this month, after moving from a small in store label to a very successful brand and wholesale market. Guide london now offer a fantastic varied collection including, knitwear, outerwear, trousers, shirts, polos, underwear and much much more. The brand now sells across the world to independent retailers from the UK, Ireland, Scandinavia, Japan, Germany and the Netherlands. We at Apacheonline.co.uk have been stocking Guide London from day one and have been extremely successful with this fantastic brand. We have just taken delivery of some great new Spring Summer 2013 designs which are having a great reaction from our customers. 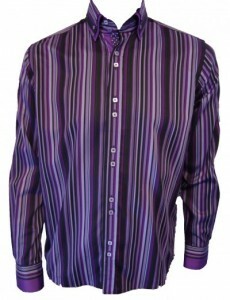 This fantastic design is the LS72492 Multi Stripe Double Collar Shirt in purple. Featuring a soft touch sateen cotton fabric, bold woven multi striped design and striking double collar detail, this is ideal with a smart raw jean for a big night on the town. 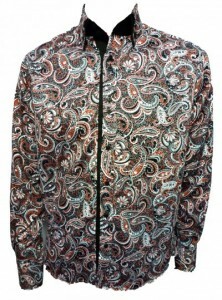 The LS72498 Paisley Print Shirt is also an absolute bobby dazzler!! With its bold paisley print and striking double collar design, this will also definitely get you noticed. If you would like to check out all our other Guide London collections including jackets, polo shirts and accessories then please visit Apacheonline.co.uk today! Glad to hear it Lee! !